We generally see in temple festivals that use of crackers is a star-attraction. It always attracts a huge crowd. But it may prove fatal too as it is a risk using huge amount of crackers at a time. Do we have a history in the past about use of crackers in temple festivals? Do such activities really please god? Any mention about it in Hindu scriptures? Burning crackers is an integral part of Diwali, the festival of lights. Crackers are burnt in each and every household and the festival is celebrated with a lot of dazzle and splendor. It is popular belief that burning of crackers marks the victory of good over evil and for attaining peace, prosperity, health and wealth. It is true that fireworks was invented by the Chinese.However, burning of cracker has become an intergal part of Diwali celebration.Hence, I believe this can not become any off-topic just because there is not mention about them in scriptures. It is believed that Mughal emperor Akbar started organising mammoth firework displays during Diwali(This celebration is due to direct relation with Jodha Bai,as they she was allowed to follow her tradition and religion). They called it aatishbazi or a grand show of fireworks. It is said that the fireworks display at Akbar’s capital Agra, could be seen from the Qutab Minar in Delhi as well. Maybe The following link could provide more details about Mughal Diwali celebration. The earliest known Sanskrit text(16th century, possibly dated between 1497 and 1539,) to mention fireworks is Kautukacintamani, by Gajapati Prataparudradeva of Orissa, contains a few Sanskrit verses on the ingredients needed to manufacture fireworks, including sulphur, charcoal, saltpetre, quicksilver, a hollow piece of bamboo and cow urine. 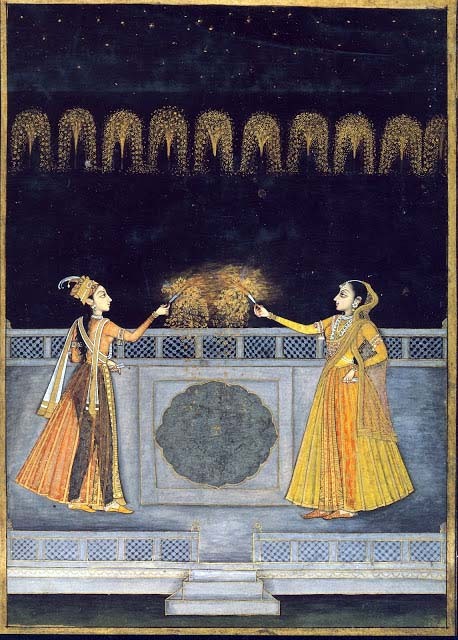 Before this text, in 1466, fireworks were said to be introduced in Kashmir, according to a Persian treatise on the manufacture of fireworks by Kashmiri king Zain-ul-Abidin, who reigned from 1421-1472. Also a treatise from Karnataka dated after 1400 describing a form of fireworks for display for the king, and a text in Marathi from the early 1500s describing the use of fireworks in a wedding procession. Duarte Barbosa, a Portuguese voyager who traveled to India in 1518, made a reference to firecrackers in his own writing, where he described a Brahmin Gujarati wedding that included “firing of bombs and rockets in plenty, for their pleasure”. These passage are extraction from a book titled 'A History of Fireworks in India', published in 1953 by PK Gode. Evidently, the tradition of bursting firecrackers on Diwali day has been around for a 300 years or more, even if it may not have been a part of the festival in ancient times. Incorporating fireworks into the celebrations of Diwali make a symbolic sense.Famous mythologist Devdutt Pattnaik comments “Sound and light were traditionally meant to scare away misfortune.” In this sense celebrating Diwali with fireworks is not against the religion. Not the answer you're looking for? Browse other questions tagged history temple festivals india . History behind the Kamakhya Temple? What is the reason behind fasting on Amavasya? What is the actual reason behind Holi Celebration? What is the story behind the legendary temple of the virgin Goddess, Kanya Kumari? Is it possible for the power of the deity in a temple to get diminished for whatever reason? What is the reason behind closing the village/street/agrahara temple in case of a death in the nearby area?